There are many personalities, inspirational artists and hidden artistic treasures that are discovered daily and from which you can learn a lot. The exchange between artists is playing a great part and very important to me personally. Each of us has our own style and personality which it projected on the canvas, yet one thing unites us: art. Recently I became aware of a special artist from Berlin. Yelizavyeta – known for her abstract and figurative representations. The works of the native Ukrainian are characterized above all by contrasting, dynamic colors and realistic painted faces of prominent women, which can be seen in her current series of paints called POSTER GIRL. See more http://www.yelizavyeta.de/. 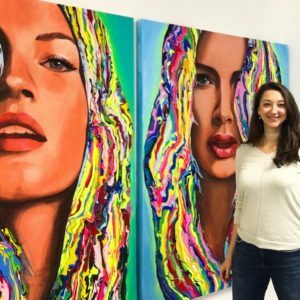 In an interview, I have had the opportunity to get to know her more ask her about her path, her vision and her inspiration for art. An interesting artist and fascinating woman. That’s exactly what belongs to my column art insights. Y: I studied art in Ukraine and during my daily life in Berlin I just started painting again and made my own website. After a while, the first request came via Facebook and I suddenly had the opportunity to exhibit for the first time with a couple of paints in a gallery. That was pretty exciting, especially because this is how I sold my first work. After that, I spent two weeks in Venice with the next exhibition. I quickly got in contact with another gallery owner and two months later I did my solo exhibition. At the beginning, you were still working alongside organizing your exhibitions. How was it to balance a job and art? Y: It was not easy. In addition to my job, I still had night shifts at home. It was like a kind of double life, but on a positive stress level which was fun! Then came my first solo exhibition, which was half sold out. That pushed me so much that I decided to go further. After the first fairs and my first print edition, I realized that it only makes sense to focus on my art. I’ve given up my old job and have been working on my art for a year now. I felt like I had to go this way, although it requires a lot of strength and initiatives from me. What were the most important milestones in your career so far? Y: The most important milestones are new contacts. Any new acquaintance or friendship that you make brings you one step further. Something that attracts you, you also attract somehow automatically. Of course, every exhibition is a great milestone. There is so much preparation behind each one. Which were the best moments so far? Y: The exhibition itself is the best moment. You are so excited and it always feels like you are doing it for the first time. It does not matter how small or large the exhibition is or whether it is a fair with two or three paints. It is always very exciting when people come to me and are interested in me. You will certainly notice that in your exhibition. Which have been the most exciting moments so far? Y: One of the most exciting moments was when some sort of art agency approached me. We got to know each other at a fair and a few months later I got the call. I did not expect it at all and then in the afternoon, they came to pick up my paints to make a campaign. A very valuable contact who has accompanied me for a year in my development. Which were the most challenging moments? Y: This is definitely the preparation of an exhibition or an important appointment. However, sometimes the bigger challenge is getting yourself out of the depths and to continue with or move on. As an artist, you are on your own and do not have a big team behind you. You only have yourself, your brush and the paint. What is your vision as an artist? Y: The world of color and women are the topics I deal with. I really like the strong contrast of colors and I just love women. I am a big fan of women and what I do is to support other women as well. My new topic “POSTER GIRL” is dedicated to a new image of women, conditioned by social media and publicity. What is interesting though: men are totally into these paints! I have more male followers on Instagram than female and on my fairs, I have mainly men as clients. It’s interesting because at first, I thought I was doing the art especially, for women. What inspires you besides women? Y: I really like fashion. It’s what inspires me most besides women. Everything I do is based on a certain fashion level. I recently saw the last fashion show of Versace and there have been those face sprints that reminded me of my own work on the clothes. I started analyzing it and until that moment I was not aware that my painted faces could also be printed on any magazine cover. When do you decide if a painting is ready? Y: When I feel like there’s enough emotion in it. Some pictures never get finished, although you cannot change them anymore. For example, I made a series by Gigi Hadid. There are four paints with the same face and yet all are painted differently. Not only the color is different and the style is different. For example, one canvas of the series was ready in half an hour, with the other I needed three days. So I cannot generalize it, every paint is only finished when it has enough emotional impact. What is your biggest goal as an artist? Y: I have so many goals! The biggest goal is of course to find a top gallery. I would love to exhibit in New York. Being in a sold-out showroom and having customers asking for more paints, even though I run out of canvases, this would be the greatest recognition for me. I apply now internationally in the galleries and New York would definitely be the destination! Y: That was an exhibition by El Bocho at the Raab Gallery. He is a graffiti artist and known for his street art. He also paints women. Some time ago I was in the Literaturhaus in Fasanenstraße. I sat there, looking over into the other room and there was this huge paint with a woman’s face on it. I just thought: Wow that’s cool! I was told that the artist’s name is El Bocho, so I went and met the gallery owners. He reminded me again that I always liked to paint faces. Is there a classic artist you like the most? Y: I think Jackson Pollock and Andy Warhol are great. These are artists who have tried new things. Their art has remained until today and is still perceived as great. For Vincent van Gogh, for example, I think the pasty paint application and the color intensity is very nice. It is inspiring that you can not only see the painted but also literally feel it. If you could change something in the art world, what would it be? Y: I think art has to take place more in public space. In Berlin, there are countless artists and more than 400 galleries. We are sitting here and the art is nowhere to be noticed. In Berlin, art simply does not live enough outside the own doors. For example, I was in Singapore and there is a piece of art at every corner of the city. Dealing with art is simply not very present here. Everything takes place in closed rooms. I also spend all day in my studio behind closed rooms and no one sees what I do. At galleries, most people pass by because they are afraid to enter. Art exists to be made outside!